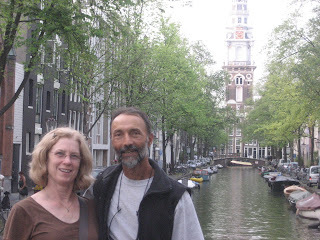 Diane and I flew to the Netherlands separately, she from California and I from South Carolina. We met at the Central Train Station in Den Haag. We each had a walkie-talkie, that we used to find each other. Den Haag is a comfortable city. It's easy to get around and we know it well. We stayed at the Centrum B&B, a short walk from the train station - nothing fancy but very convenient. 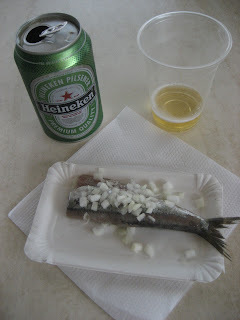 We toured the city center, took the tram to the Schevenigen boardwalk and enjoyed a fresh herring at the harbor (downing it with a Heineken). 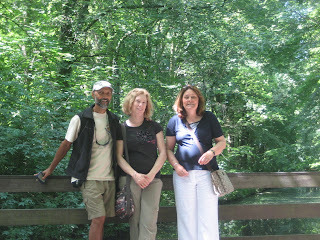 On our second day we met with my Dutch cousin, Anke, walked the Den Haag Woods to her apartment and had a traditional "rijsttafel" dinner together near Anke's home. Unfortunately, we didn't abide by the saying that you don't eat Indonesian food at a Chinese restaurant (and visa-versa). At best, I would say that dinner was mediocre and lacked Indonesian authenticity. Live and learn. In Amsterdam we stayed with our friends Maria and Maarten. Together we went into Amsterdam to the Rembrandt Museum's exposition of Jan Lievens, a friend and colleague of Rembrandt. Afterwards, our friends' son, Geert, picked us up in his small steel-hulled skiff to cruise the Amsterdam canals. We stopped along the way and stocked up on Heinekens and chips. A perfect way to spend an afternoon in Amsterdam. 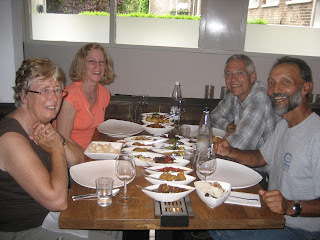 After the canal cruise we had a fabulous and more traditional Indonesian "rijsttafel" at the Blau restaurant. There must have been twenty or so dishes, each with a unique flavor. We devoured the entire meal as if we hadn't eaten in a week. Afterwards we met up with Geert and Fanilla for an after-dinner drink at their home. All-in-all, a nice way to conclude our visit to Amsterdam. The following day Maria and Maarten were kind enough to drop us off at Schiphol for our flight to Munich.